In years gone by, assessment design and development was not a requirement for Trainers and Assessors. It generally sat with a group of skilled people who understood the training package in context and created comprehensive assessment tools to meet this criteria. In April 2016, The Training and Education (TAE) Training Package was updated to include, ’Design and develop assessment tools’ and, ‘Address adult language, literacy and numeracy (LLN) skills’ units. By April 2019, all Trainers and Assessors must hold the new Cert IV in Training and Assessment (TAE40116) or gap skill where applicable. For more information on this, check the units of competency on training.gov.au or with Velg Training or MySkills. 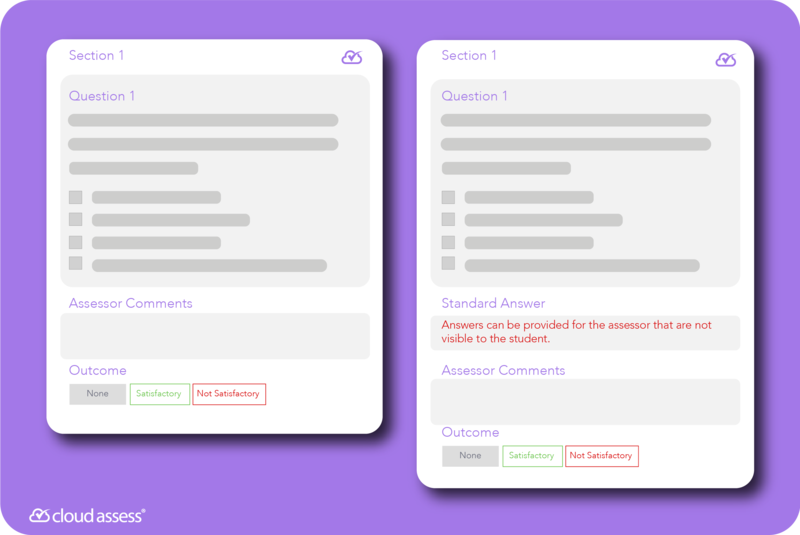 As designing and developing of assessment tools is a hot topic, we thought we’d show you how easy it is to create assessments in Cloud Assess. Furthermore, features that support your compliance obligations allowing you to effortlessly follow the Rules of Evidence and the Principals of Assessment. Cloud Assess is an online assessment and training solution. It specifically supports RTOs to author, assess, manage and control their assessment requirements in line with the standards. Cloud Assess supports any evidence gathering assessment type and allows you to create instruments for, Observation based methods such as practical assessments, Questioning such as recording verbal questioning to mitigate LLN issues, or Portfolios such as log books and so on. You can even work in RPL mode to gather a range of evidence such as interviews, reports and proof of prior learning. When using Cloud Assess you don’t only get the experience and interaction gains of an LMS, but also the VET aligned features that support quality assessment practices. When designing you can use rich text boxes, multiple choice, sketch pads, audio, video, checkboxes, auto-marking and more. Marking can be made relatively easy by including outcome fields throughout your assessment. 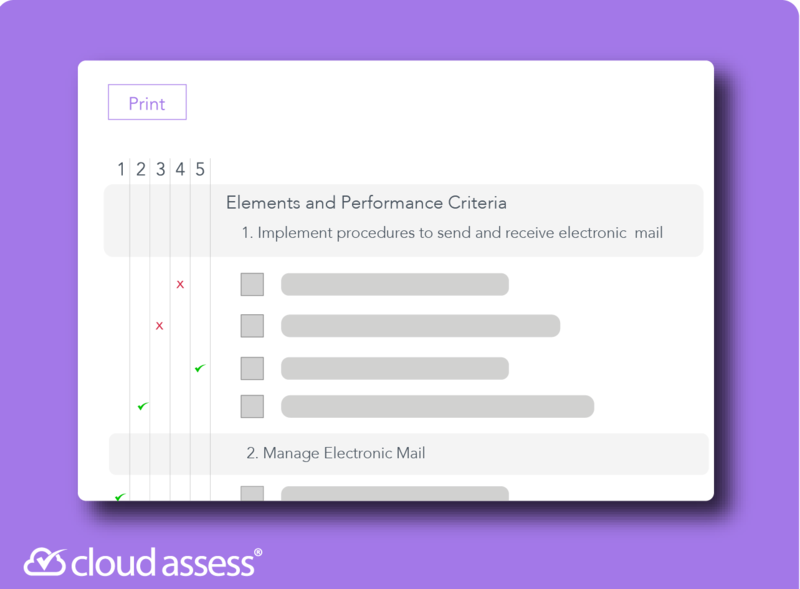 You can create an Observation Checklist in Cloud Assess with great ease and flexibility. It can be applied using a phone, tablet or computer when assessing a student face-to-face. When designing, forget seperate facilitator guides. You can build clear Assessor Instructions, where applicable, to ensure reliability of the instrument. This information is not part of the student’s view. All the evidence can then be gathered and instantly stored in the cloud as per your requirements. The different views are prescribed by user type. The left shows the Student’s view and the right shows the Assessor’s view. When designing assessments it is essential that the created content is aligned with the unit of competency to ensure all requirements are covered and in-line with the Elements and Performance Criteria. The unit of competency and related information is pulled from training.gov.au and when an assessment is designed and built you can map the elements or requirements to components of your instrument. The image above shows how you would perform a gap analysis with numbers 1-5 indicating your assessment instruments. Insert a digital sketchpad into the assessment. This is user-friendly and easily captures a diagram rather than requiring the student to draw something on paper or upload an attachment. Request a 20 second video or audio recording to replace a 200 word written answer. This is a great way to support students with LLN needs. Each Record and Student has a timeline, a historical and chronological list of actions and activities indicating the currency and sufficiency of the evidence. 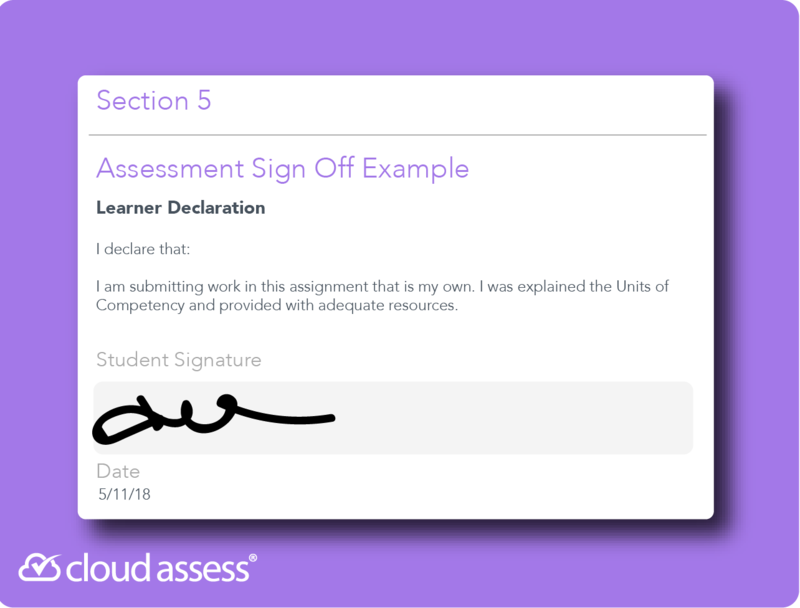 Insert signature fields whenever possible for both the Assessor and Student to make a declaration and support authenticity. Cloud Assess also comes with the Stats feature. This is live data across all of your assessors and assessments showing the outcome rates. It provides a source of information to indicate the reliability of your assessments and highlights opportunities to make adjustments. With Cloud Assess it is really easy to drill down to the detail and record continuous improvement notes as you go. Who knows, 1 year from now, this could be how you design and develop your assessments.